This is the final section of a substantial work for flute and tape, scored primarily for piccolo (the entire piece calls for the full range of flutes from piccolo to bass). The darting, furtive nature of the flute figuration (which suggested the title of the work) is contrasted with a gradual accretion of computer-synthesised sound, from isolated pitches at the start to mass textures at the end. The number of voices is regulated by the Fibonacci series, ensuring a natural progression in density. The tape part was realised entirely in Csound, using granular synthesis. She holds a DPhil from the University of York, where she studied under Nicola LeFanu and has attended courses with Peter Maxwell Davies, Boguslaw Schaeffer, Kaija Saariaho (at IRCAM), Louis Andriessen and Jonathan Harvey, amongst others. 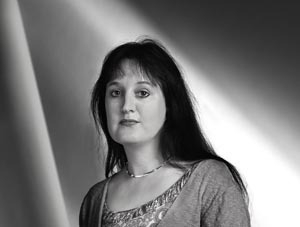 She has been the recipient of numerous awards and prizes, and has twice represented Ireland at the ISCM International Rostrum of Composers. In January 2007 she was featured in the NSOI Horizons series.